Ald. 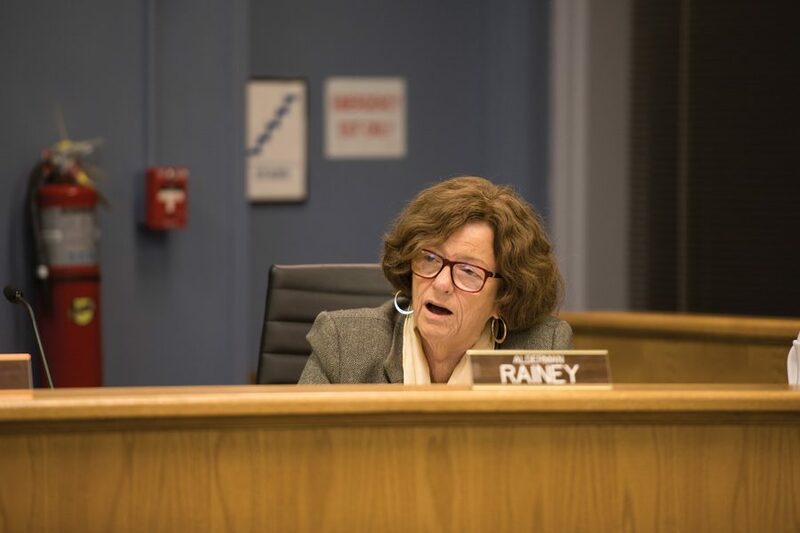 Ann Rainey (8th) at City Council on Monday. Rainey has been a driving force in the redevelopment on Howard Street. Two 8th Ward restaurants launched with the city’s help have returned more than $570,000 to Evanston in economic impact, city officials announced Monday. The report, presented at City Council, listed the costs and revenues garnered from Peckish Pig, 623 Howard St., and Ward Eight, 629 Howard St., which opened in 2013 and 2012, respectively. Both restaurants are located in buildings that were at one point owned by the city. Peckish Pig continues to lease from the city, while the Ward Eight owners bought their building last year. City manager Wally Bobkiewicz told The Daily that Peckish Pig owners are getting ready to buy their building from the city, and will likely do so by the end of the year. The report was put together at the request of Ald. Ann Rainey (8th) in response to criticism of the city’s redevelopment efforts in the area. A significant portion of Howard Street’s redevelopment has also been paid with tax increment financing. The funding method siphons off tax money collected from property taxes and directs it to funds most often used for economic development projects. The city used TIF to buy the two properties where Peckish Pig and Ward Eight are now located. TIF funds have also been used to “revitalize” the buildings occupied by the restaurants, according to the report. Bobkiewicz said at the meeting it was “unfortunate” that the efforts on Howard Street had been criticized, and called the city’s investment in the area a “textbook” example of redevelopment. Economic redevelopment of Howard Street has been a focus of Rainey’s, who has also been involved with talks to install Chicago-based theater company Theo Ubique as the tenants of a theater on Howard Street. Ald. Donald Wilson (4th) said Monday that he voted against the plan when it went through council years ago. The report also indicated that Peckish Pig created 38 jobs and Ward Eight created four. Additionally, Peckish Pig generated $44,000 in property tax revenue in 2016 — in 2012, before the restaurant moved in, the same property only generated $25,000. The report noted the effect the restaurants had on the surrounding area, citing them as a stabilizing force on Howard Street and a magnet for other businesses, such as North Shore Cider Company and Sweet Temptations Bakery. “The dollars and cents of it really don’t capture it, really don’t capture the transformative nature of these projects,” Bobkiewicz said.